Author of the worldwide best selling “The Shell Seekers” has sadly died, aged 94. Born in Lelant (between Hayle and St Ives) on the north coast of Cornwall on 22nd September 1924, Rosamunde had her first short story published at the age of 15. She served in the WRNV from 1943 until 1946 and then married Graham Hope Pilcher on 7th December 1946. In 1949 her first novel, Half-Way To The Moon, was published under the pseudonym Jane Fraser by Mills & Boon. Her stories were set in her beloved home county of Cornwall. “The Shell Seekers” made the top of the New York Times bestseller list, where it stayed for 48 weeks. The book became one of her biggest successes, selling more than five million copies worldwide. There have been several film/tv adaptations of her books, particularly in Germany. The German television network ZDF bought the rights to over 120 of her short stories and shorter novels; these were all filmed in Cornwall. She was awarded the OBE (Order of the British Empire) medal in 2002 for services to literature and an honorary Doctor of Laws degree from Dundee University in 2010. 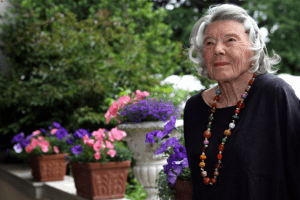 Read more about the life and works of Rosamunde Pilcher on our page.